As those Christmas cards keep rolling in, you may find that the fireplace mantel or your card wreath are filling up and you need another way to display greetings from family and friends. Enter the DIY card tree! This is a great project for families to tackle on a snowy afternoon, and it’s perfect for people of all ages. Grab some supplies, pull up a chair and let’s get started! 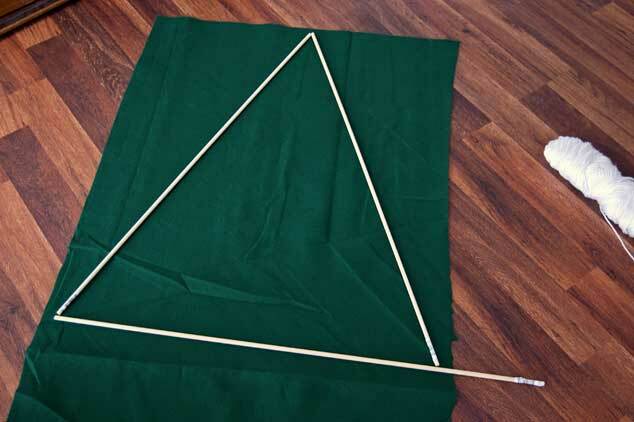 Step 1: Lay your fabric out flat and arrange the dowels on top in the shape of a triangle. Part of the bottom dowel will hang off, but that’s okay. We’ll trim off the extra later and use it to hang the tree. If your little one starts to get impatient at any point during the measuring and cutting, feel free to have them jump ahead to stringing the pompom garland! That’ll keep tiny hands busy while you finish up the preparation. Step 2: Measure and mark (with chalk) one inch around the outside of all three dowels. If the kids are doing the cutting, you may want to connect the dashes with the yardstick so the line is easier to follow. While you’ve got your chalk handy, mark the dowel where it needs to be trimmed off. Then, cut out the tree! Wrinkly felt? Now is your last chance to remedy that. 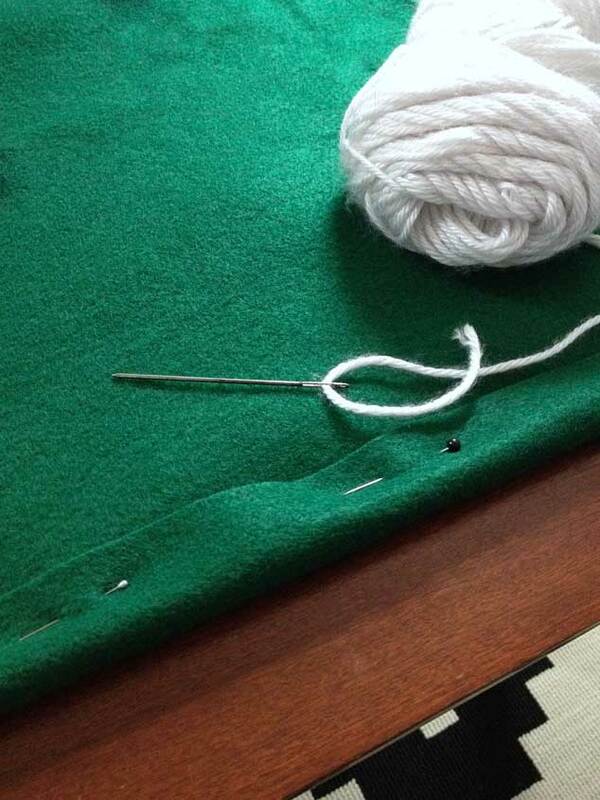 Don’t use an iron directly on felt as it will melt the fabric. Instead, dampen the cloth and lay it flat to dry under something heavy or use an iron on its lowest setting with a pillowcase in between the iron and felt while you keep the iron moving constantly. Step 3: Cut off the extra length of dowel and set it aside. The saw in my pocketknife was the perfect tool for this job! 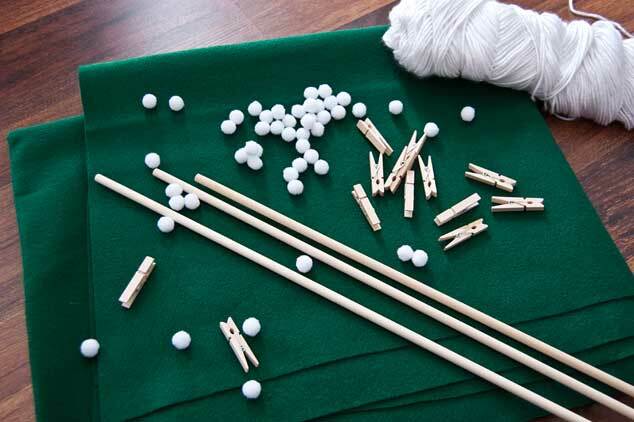 Step 4: Now we’ll prepare for sewing by folding the extra felt over the dowels and pinning them in place. Basic sewing is a great skill for kids to learn (I have fond memories of the day when my mom taught me), and this is the perfect first sewing project since the stitching is in a straight line. If you aren’t sure your child is ready, you could certainly hot glue the felt in place instead. Step 5: Once all three sides are pinned, lay out your tree on a table and begin to stitch around the edges to keep the dowels in place. 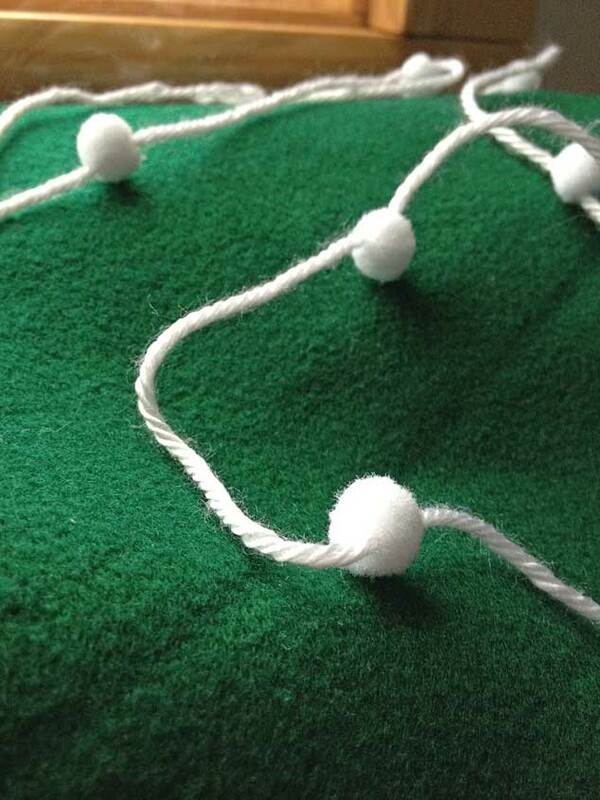 Step 6: Create your pompom garland by threading pompoms onto a length of yarn. I wrapped yarn around my tree first so I knew exactly how much I’d need. The pompoms can be as close together or far apart as you’d like, just make sure there’s space to get some clothespins on there! Once that’s done, plug in your hot glue gun so it’s nice and warm when we start securing the hanging device and garland. Step 7: Now let’s bring back that extra bit of dowel that we lopped off! Settle this into the back of the frame wherever it fits best. 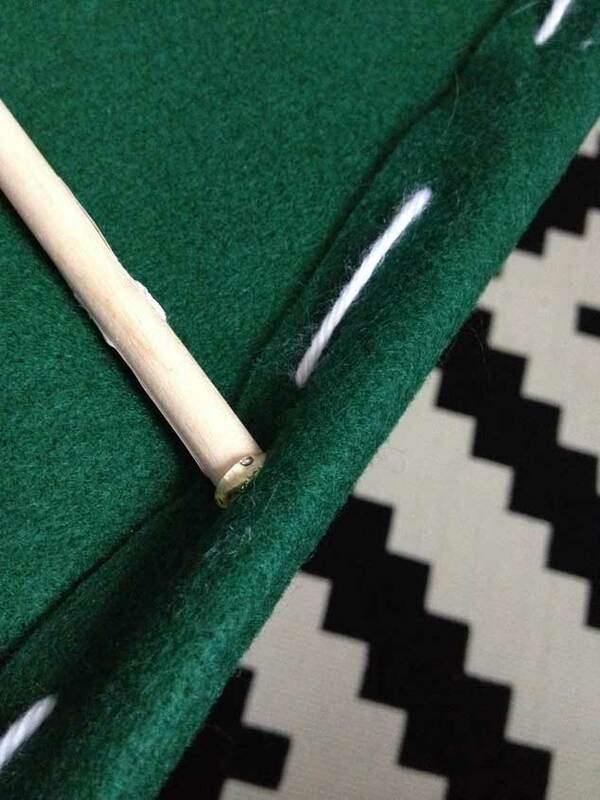 Try to find the perfect place where it rests without bunching or stretching the felt. Hot glue it to the sides of your tree frame. And now your tree is almost ready to be hung! Step 8: Wrap your finished pompom garland all the way around your tree and hot glue it to the back of the frame to keep it in place. 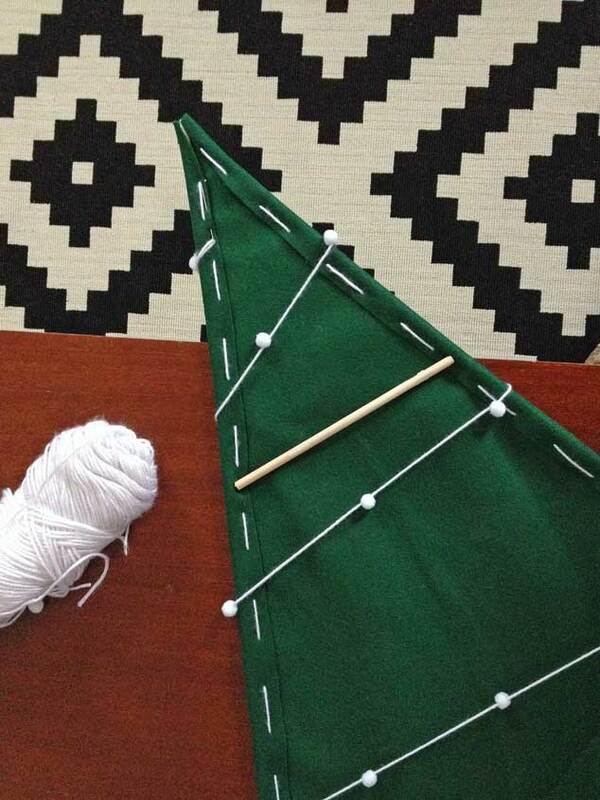 Step 9: This last step is probably the easiest; it’s time to make your tree topper! I liked the simplicity of a yellow circle instead of a star, so I traced a jar lid onto the back of adhesive yellow felt, cut it out and just stuck it on. Voila! Now you just need to find the perfect place to display and string up all of your family’s Christmas cards. 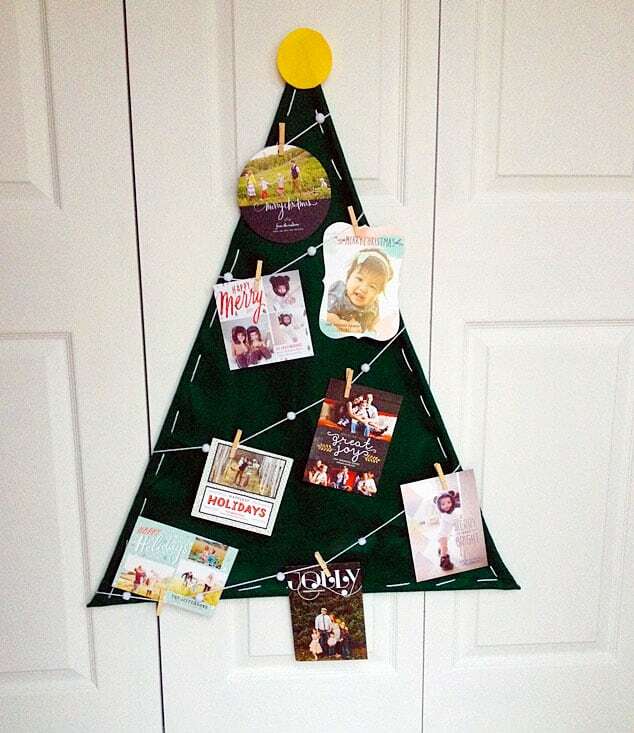 Placing the tree down low (like on the doorknob of an infrequently-used closet) will allow the kids to easily add cards as they come in the mail. They’ll have fun picking the perfect spot for each card, and be able to admire their very first sewing project up close. Have fun making your new Christmas card display and enjoy the family time. Coming together to make new memories is what the holiday season is all about. Thanks to Julia Marchand for contributing this project. Julia is a home décor and DIY blogger at TinyPrints. She is a self-proclaimed vintage-loving gal who spends her time sewing and crafting in her scenic New England home. Julia loves the holidays, but this year is particularly special because she is expecting her first child. 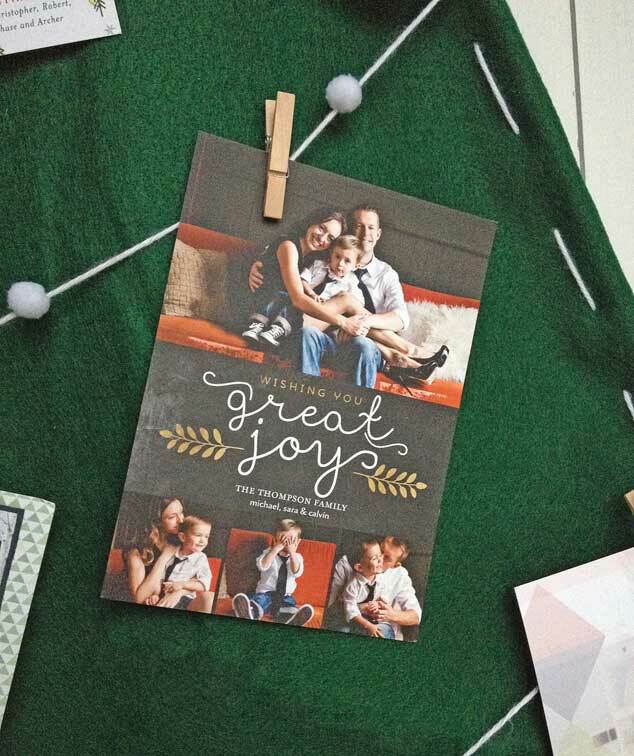 Find other creative ways to show off your holiday cards on the TinyPrints blog, or follow Julia on Twitter.